In January 2018, our community lost a great friend and champion, when Geoff Bowen of Pebblebed Vineyards died. It was a huge shock to us all and he is greatly missed by family, friends and our entire community. Here’s our tribute, delivered at Geoff’s celebration in Clyst St George. Geoff was an extraordinary person: husband, father, son, friend, geologist, environmentalist, wildlife conservationist, visionary viticulturist, winemaker, entrepreneur, sailor, kite surfer, cyclist, runner and all around action man. Geoff had boundless energy, the imagination to have wild, crazy, impossible, dreams, and the will and determination to somehow make them come true. The sheer joy with which he lived life in the fast lane was totally infectious. Geoff was someone who made you happy just to be around him. Many here today know Geoff through Pebblebed, and this is fitting. For the wine that he created was entirely in his image: fresh, vivacious, open, generous, bubbly and effervescent. Just like Geoff. The things that mattered most to Geoff were family, friends and community. Topsham was one of Geoff’s many communities and how we will all miss him. Around Topsham, Geoff was a do-er. When something needed doing, he was there, up a ladder to put up or take down Christmas lights, or helping to lay out the hundreds of tables for Nello’s Longest Table, an event that embodied all the things he held most dear. Geoff believed passionately in Topsham, the need to keep our town vital and prosperous. Even as recently as November, he felt an urgent need to do something to help combat the impact of online shopping and supermarkets on the local economy. So he put posters all around town, and convened a public meeting in the Pebblebed Cellar that was attended by some 70 people. Here he shared his vision for the community he would soon leave behind: not one of boarded up banks and empty shops, but a thriving town with proud, interesting, independent businesses, varied places to eat and drink, cycle-friendly with good public transportation, a place where the quality of life is unsurpassed. The town that Topsham is, can and will continue to be, provided, Geoff urged passionately, that we all continue to work together as a community. Community lay at the heart of Geoff’s vineyard dream, too. The first small vineyard that Geoff planted in 1999, together with like-minded friends and families, was the Community Vineyard, on David and Gail’s southfacing field in nearby Ebford. The resulting wine was good. In fact, Geoff was so encouraged with the potential of these early results that he took the bold and life-changing decision to cultivate a commercial vineyard. Thus in 2003 Pebblebed Vineyards was born. Why Pebblebed? As a geologist, Geoff understood the importance of terroir in determining the quality of wine. An underlying sub-strata of this part of East Devon consists of bunter pebblebeds dating back millions of years to the Triassic era when a vast raging torrent washed over this area, tumbling and polishing the smooth stones that eventually emerge on Budleigh Salterton beach. So the name Pebblebed was born from science and geology. But there was also romance and poetry — Geoff delighted in making wine from grapes grown on land that had once been the domain of dinosaurs! As a scientist and environmental consultant, Geoff was keenly aware of climate change and the challenges that it would bring; but, ever the optimist, he was also quick to see that every cloud could also have a silver lining. With global warming, he surmised, southern England could be the world’s next new and emerging wine region. At the time, many thought it was an impossible, crazy dream, but in fact, the improvement in and global success of English wines in recent years has proved that he was right. Pebblebed wine quickly established itself on the market — with the distinctive Pebblebed label created with Anna’s keen eye for graphic and typographic design, the wines were modern and exciting — Geoff was an early and avid proponent of the screwcap. At a time when many people shied away from buying English wine due to its perceived higher cost compared to industrially produced wines from France, Spain, Australia, or elsewhere, Pebblebed bucked this trend, not least because of the infectious enthusiasm and personal charm of its producer. And the wines were good! 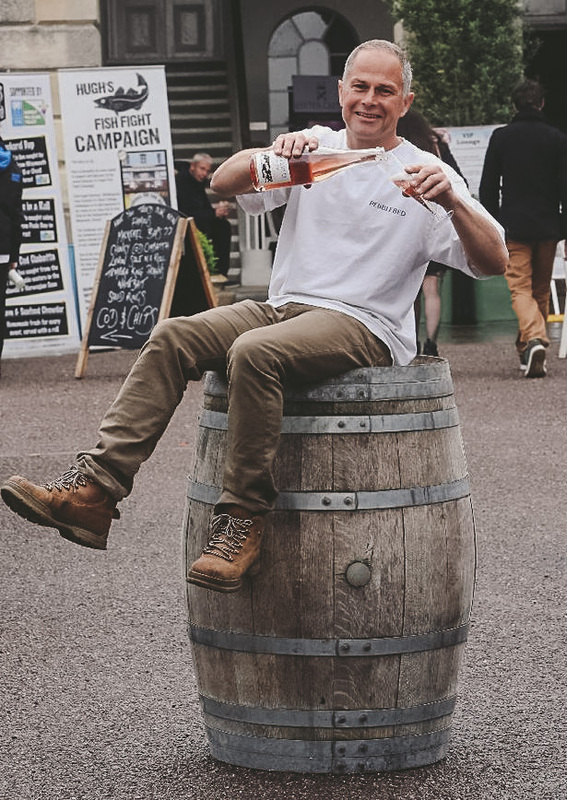 Over the years, Pebblebed has regularly won numerous prestigious Gold and Silver awards from the South West Vineyards Association as well as other national awards. It is true to say that Geoff has helped to put the wines of Devon firmly on the world wine map. In 2011, Geoff was invited to enter the Dragons Den. On national television, he presented his commercial plan for investing in a shared vineyard and then endured the toughest cross-examination from the Dragons. Yet even under duress, Geoff’s winning personality and enthusiasm convinced hard-headed Dragon Duncan Bannantyne to invest in the Pebblebed Partner Vineyard scheme. Geoff and Anna eventually purchased the Marianne Pool Farm here in Clyst St George. He installed a modern winery and found in Alex Mills an enthusiastic and talented young winemaker who could help him take Pebblebed to the next level. Little by little, working with friends such John and Jane Pyne and David and Gail, Pebblebed grew to be the largest vineyard in Devon, capable of producing in a good year upwards of 40,000 bottles of wine all from its own grapes. Yet for Geoff, Pebblebed was never just a business and friendship lay at the heart of it. For him, wine — growing it, making it, drinking it — above all was a means to enjoy life. Wine was and should always be fun, he believed, and Pebblebed gave him and many others the greatest pleasure. The Pebblebed wine van, a vintage Citroen which only Geoff could start, became a familiar and welcome sight at events and festivals, most notably the Exeter Festival of South West Food and Drink. And the Topsham Pebblebed Cellar was where we all dropped in both for a quick glass with Geoff, as well as to celebrate the most important moments of our lives. The annual Pebblebed harvest was always an incredibly happy affair. In inviting anyone at all to come and help pick grapes, Geoff was able to share with literally hundreds of people the magic of this very special moment of the year. Picking grapes is hard, backbreaking work but with music (Lily on the fiddle), children treading grapes in a bathtub by barefoot, with oceans of wine, food — sometimes steaks cooked over vine shoots or a hog roast with local pork —, it became a joyous celebration of an annual miracle, the transformation of fresh grapes into wine. In spite of his ambition, his many accomplishments, numerous achievements and awards, Geoff was humble and modest. He used to say that his aim was simply to make wine that puts a smile on peoples’ faces. And so I say, on behalf of each of us, Thank you, Geoff, for a thousand smiles.